When Paraba tourmaline was first discovered in Brazil in the 1980's, the unusually intense "neon" or "electric" blues and greens set it apart from any other tourmaline previously known. The color of this gem ranges from intense emerald green through vivid Caribbean blue to a rich sapphire blue. Apart from its intense colors, another key feature of Paraba tourmaline is its relative lack of extinction, best described as a lifeless area within a stone. appearance, refractive index and high birefringence; then optic figure, pleochroism and specific gravity. Has intense saturated color. Crystal habit is prismatic and may be 3, 6 or 9-sided; often a triangular prism with convex faces, and often long and heavily striated parallel to the c axis. Pyramidal terminations are common. Tourmaline is part of an isomorphous series.Cuprian Elbaite must have copper present to be called Paraiba tourmaline.Originally found in the Brazilian State of ParaibaDark material might have a birefringence as high as 0.040. 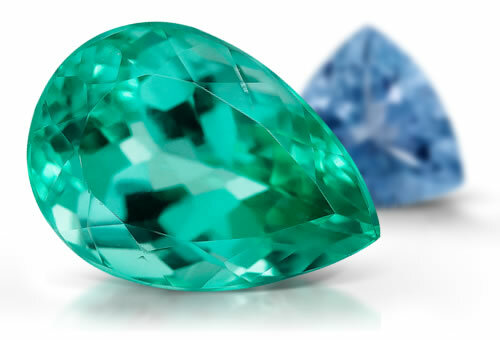 Paraiba tourmaline is a type II clarity stone. Stones might contain liquid and gas inclusions that are long and thin, reflective gas-filled fractures and color zoning.